Schematic illustration of a black hole Carnot cycle. The system consists of a black hole and a photon gas, enclosed in a box. The size of the black hole is proportional to the temperature of the system, i.e. small is hot and large is cold. The comparison of geometrical properties of black holes with classical thermodynamic variables reveals surprising parallels between the laws of black hole mechanics and the laws of thermodynamics. Since Hawking’s discovery that black holes when coupled to quantum matter fields emit radiation at a temperature proportional to their surface gravity, the idea that black holes are genuine thermodynamic objects with a well-defined thermodynamic entropy has become more and more popular. Surprisingly, arguments that justify this assumption are both sparse and rarely convincing. Most of them rely on an information-theoretic interpretation of entropy, which in itself is a highly debated topic in the philosophy of physics. We discuss some of the pertinent arguments that aim at establishing the identity of black hole surface area (times a constant) and thermodynamic entropy and show why these arguments are not satisfactory. 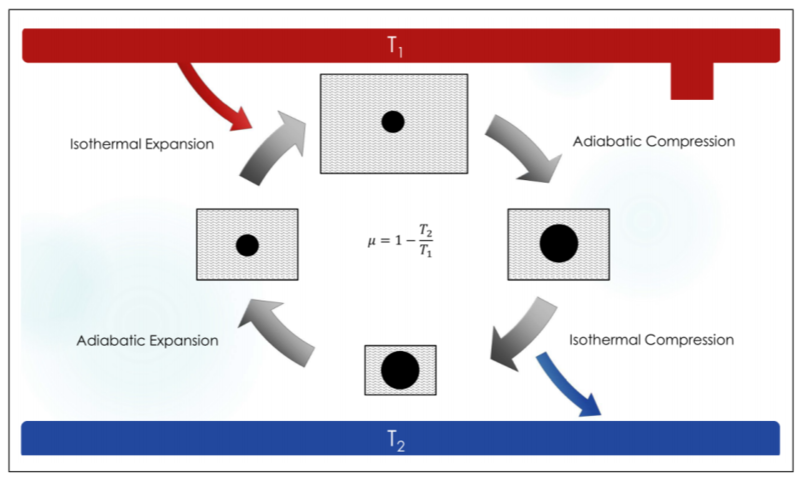 We then present a simple model of a Black Hole Carnot cycle to establish that black hole entropy is genuine thermodynamic entropy which does not require an information-theoretic interpretation. This entry was posted in History and Philosophy of Physics and tagged BLACK HOLES. Bookmark the permalink.